Arthritis is a common condition that causes pain, inflammation and stiffness of the joints. The two most common types of the joint problem in the UK are osteoarthritis and rheumatoid arthritis. There is no cure for arthritis, but symptoms can be managed with treatment. Painkillers taken in tablet form are a typical treatment for the condition. However, people who find they need to take painkillers regularly to treat symptoms of arthritis may not want to keep popping pills. “While over-the-counter and prescription pain medicines can be effective if used properly, there are possible risks whenever you take a pill. 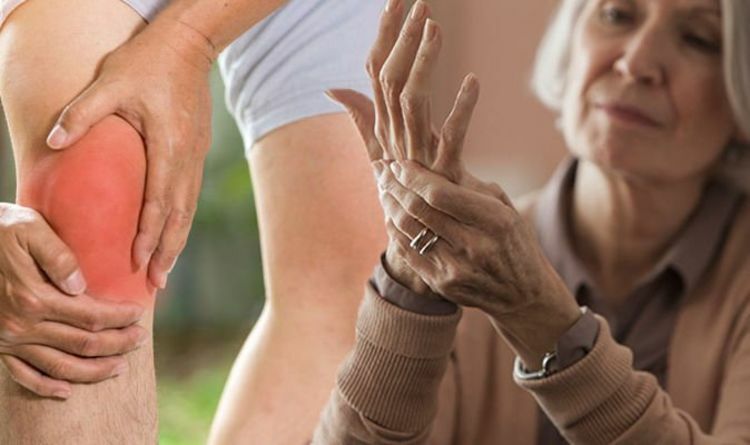 So many people want to explore alternative pain relief therapies,” said the Arthritis Foundation. Topical medications include gels, creams and patches that are applied to the skin. They supply sodium channel blockers, such as lidocaine or prilocaine, to relieve pain. Doctors can also prescribe non-steroidal anti-inflammatory drugs (NSAIDs), in the form of drops, gels, sprays and patches. Sodium channel blockers work by numbing nerve endings close to the skin. Topical NSAIDs work by reaching the joint fluid and decreasing inflammatory proteins. Physical therapy is a treatment using exercises designed to improve posture, strength, function, range of motion and to reduce pain. Exercise in general is promoted by health professionals for people with arthritis, as it can help to improve flexibility and strengthen joints. Make sure you don’t overdo it when exercising and stick to low-impact sports like swimming, water aerobics and cycling. Applying heat and cold to the affected areas can help relieve pain and symptoms associated with arthritis. You can apply heat with heating pads, warm compresses and heat patches, or you could even try a warm bath. You can apply cold with a cold pack, ice pack or a bag of frozen vegetables. Never apply ice directly to the skin. Heat works by increasing the blood flow to the area in pain and relaxing the muscles. Cold works by travelling along large nerve fibres, superseding pain sensations that travel along smaller fibres. Cold also reduces swelling and inflammation by constricting the blood vessels.